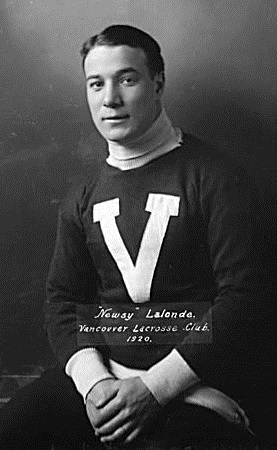 Remembered by most people now for his legendary hockey career with the Montréal Canadiens, ‘Newsy’ Lalonde’s claim to sporting fame in British Columbia did not come from ice hockey – although he did play a season with the famed Vancouver Millionaires. Rather, he was regarded, quite simply, as the greatest lacrosse player of his era when he graced the British Columbia lacrosse scene with the Vancouver pro lacrosse clubs for nine seasons interspersed between 1909 and 1924. An Easterner born in Cornwall, Édouard ‘Newsy’ Lalonde made his lacrosse debut, as a goalkeeper, in 1905 with the Cornwall Colts of the National Lacrosse Union. His first season was fairly forgettable as Cornwall finished last in the five-team league with a record of 1 win and 7 losses, with ‘Newsy’ letting in 41 goals for a still-decent goals-against average of 5.66. The following season saw Cornwall move up to fourth-place in the expanded, seven-team league. Lalonde improved to 8 wins out of 14 matches, with 80 goals against and an average of 5.33 He finished in second-place in the league for wins by a goalkeeper. In 1907, Cornwall inched up further in the standings, to third-place. ‘Newsy’ let in 63 goals (5.36 GAA) that season to slip down to third-place for winning record amongst goalkeeper, with 8 wins in 11 matches. His final season with Cornwall – and in goal – saw ‘Newsy’ finish in second-place, behind ‘Bun’ Clark of the Toronto Tecumsehs, with 7 wins and 4 losses. He let in 48 goals for a 4.39 goals-against average, the best average of his career and the best of any full-time goalkeeper playing in the National Lacrosse Union that season. In all, Lalonde’s goalkeeping career saw him appear in a total of 44 matches on duty between the posts, with a win-loss record of 24-20. He had 232 goals scored against him for a fairly impressive 5.27 goals-against average. While ‘Newsy’ Lalonde would earn his accolades and legendary fame after he left the crease and became a formidable goal-scoring threat, one still has to wonder: why didn’t he continue as a goalkeeper? His ability in goal was as good as to any goalkeeper who played on the Pacific Coast. 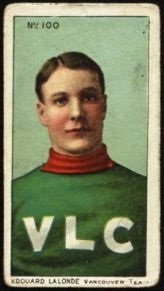 It is unknown what was the exact impetus that triggered ‘Newsy’ Lalonde to switch opposite ends and roles on the field, going from goalkeeper to inside home when he traveled westwards in 1909 – going from the one who stops the shooters and goals to becoming the primary shooter and goal-scorer on the team. Whatever the reason was, as Ontario lacrosse historian Paul Whitside stated in his own research work, the switch in positions had as revolutionary an impact in lacrosse as when Babe Ruth went from being a pitcher to a slugger in baseball some ten years later. Lalonde appearing on a cigarette card from 1911. After coming west in 1909 as a hired-hand with the Regina Capitals to compete against the New Westminster Salmonbellies in their challenge for the Minto Cup, playing as a defenseman, Lalonde then decided to remain in British Columbia with the Vancouver Lacrosse Club for the 1909 season. In 1911, Vancouver Lacrosse Club president Con Jones offered him a fortune of a contract rumoured in the range of $3,500 (or $72,000 in modern currency); this was more than double what he was earning with the Montréal Nationals the previous season. To compete against that perennial powerhouse squad of legends and hated rivals, New Westminster Salmonbellies, Con Jones went out and bought the best player in Canada that money could buy: ‘Newsy’ Lalonde. ‘Newsy’ would pay off Jones by helping lead Vancouver to three Minto Cup pro championships – in 1911, 1918, and 1920. He played what was back then called the inside home position – basically an attacking forward who played on the crease as the primary threat against the opposing goalkeeper – and his goal-scoring prowess was critically important to the success of his Vancouver team as Lalonde constantly went up against some of the finest New Westminster goalkeepers of the day, stalwarts such as Alex ‘Sandy’ Gray and then later the legendary Alban ‘Bun’ Clark. During his nine seasons spent playing for the Vancouver Lacrosse Club and Vancouver Terminals, ‘Newsy’ finished 10th in overall career games played (2nd with the Vancouver club) and 3rd overall in career goal-scoring with 147 goals in 93 games. 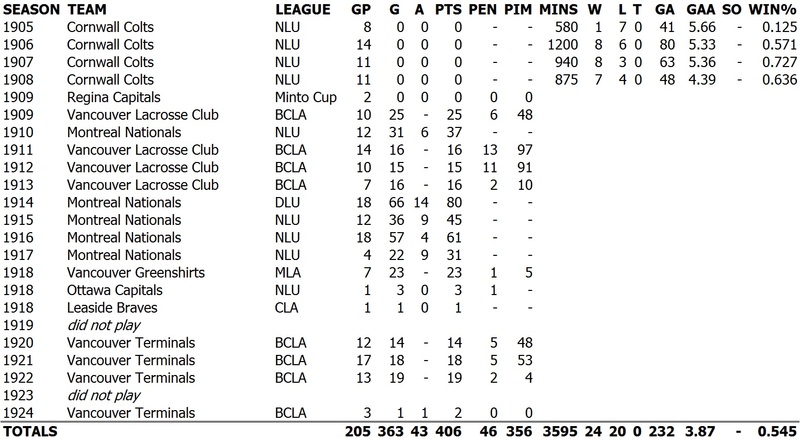 However, what is more impressive is in five of those nine seasons with Vancouver, he led the league in goal-scoring (and in 1911, also in penalties). 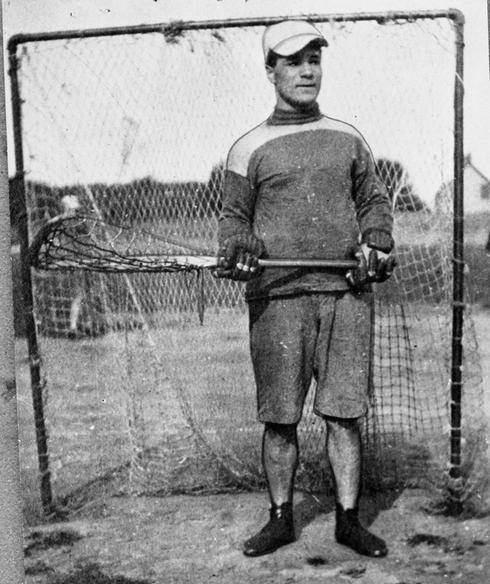 During a ten-season period from 1910 through 1918, and regardless whether he was playing out west in the British Columbia Lacrosse Association with Vancouver or back east in the National Lacrosse Union or Dominion Lacrosse Union with the Montréal Nationals, Lalonde would lead the respective league for goals in all seasons but one. In an era when lacrosse was notably rough and tumble and players wore no padding, all the while swinging wooden sticks, Lalonde was one never to back down from the toughness aspect of the game. His favourite tactic was to crowd his check and bull his way through opposition. Along with all his goals, the intensely competitive Lalonde also amassed 45 penalties and sat out more than any other player with 356 penalty minutes during his career on the West Coast. In 1950, he was selected by a panel of Canadian sports journalists as the greatest lacrosse player of the first-half of the 20th century. He received an impressive 13 votes compared to his next two challengers, Billy Fitzgerald (6 votes) and Herry Hoobin (5 votes). Most notably, three current lacrosse inductees in the BC Sports Hall of Fame from the same playing era – Alex Turnbull, Cliff Spring, and John Crookall – only managed to received 1 vote (for Turnbull) amongst them. Interestingly enough, his nickname ‘Newsy’ came from his youth when he worked, first as a reporter and then later in the newspaper plant as a printer, for the Cornwall Freeholder and Woodstock Express. As a fitting, final tribute to his career, Édouard ‘Newsy’ Lalonde was an obvious choice for the initial inductees to the Canadian Lacrosse Hall of Fame in 1965 in the ‘field player’ category.